Where do you purchase your Fat Quarter bundles? Thread: Where do you purchase your Fat Quarter bundles? I received an email from Whittles fabrics regarding their fat quarter bundles. The prices look good. I'm wondering if there are other shops that carry a larger variety. Where do you purchase your FQ bundles? The last fat quarter bundle I bought was from an etsy seller, but I have bought them from Craftsy as well. When I use a fat quarter I always seem to run out. I'd rather have a half yard. Quilted twins in Florida has bundles of half yards priced at $3.99 per yard. Yes, I belong to the fabric moratorium and yes, I had to do pushups, but I have three boxes of bundles due here any day now. I also buy FQ's and yardage from Quilted Twins in Florida. They are my first "go-to" place, and if they don't have what I need, they usually have something that I just can't live without! Missouri Star, Etsy, Ebay, a few other online sellers. 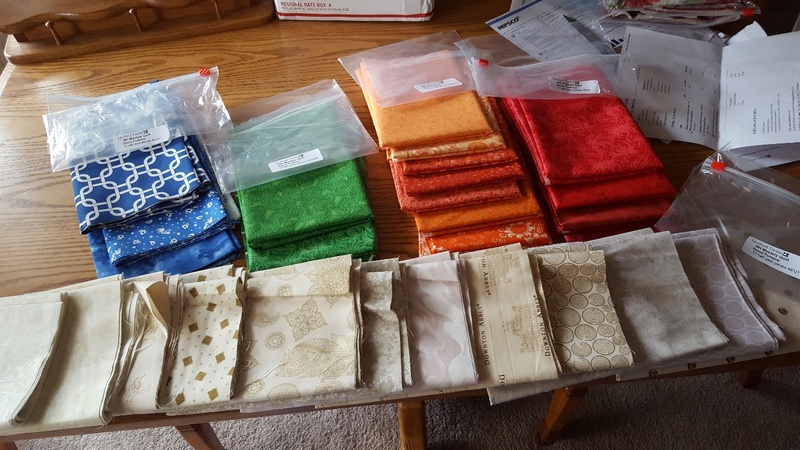 My BHMQ Good Fortune quilting fabric bundle just arrived. Here is what I got for $92.00 plus 5 to ship. Total $97.00. I usually buuy from the Fat Quarter shop. They carry FQ's 1/2 yard cuts & Fat Eighth. I mix & match to get what I need. Just a reminder about the cost. Whatever the FQ is needs to be a better deal than if you bought 1/4 yd of fabric. Folks will come in to the store and buy a bunch of FQs when they are $2.00 per. That would be $8 per yard of fabric. When a Calico is at 40% or 50% sale or coupon, it is a lot cheaper than that. Beautiful fabric. And you don't have to go rummage thru your stash or go out into the storm to shop. Smart girl! Good luck on your new mystery adventure. What a great site. Lots to see. Thanks! Thanks for the remind about Quilted Twins. I was just tooling around and liked what I saw. When I ordered from the Twins and my package arrived it had stains on the outside of the package. The post office said a bottle of red liquid vitamins got broken and stained a lot of items. Boy am I glad the Twins put our fabric in plastic bags, all was dry and no harm done. I love this discussion. thx ladies. for all the ideas. Last edited by mindless; 11-14-2018 at 09:33 AM. oooohhh...noooo I'm going to check them out again. I have some holes in my colorways. Thanks so much for the recommendation. I just purchased from QuiltedTwins. I got so excited by the low prices, I didn’t notice until after that only one of the bundles I selected said “quilt shop quality” in the description. I sure hope the other bundles I ordered are decent quality. Can I just say that the title of this thread cracks me up on the home page because it only shows up as "Where do you Buy your Fat...". I chuckle to myself and say, "Oh, goodness, honey. I don't buy my fat. It appears for free out of nowhere." Please let us know PamelaOry. I was wondering about that notation myself. Thanks! From what I could see most of the Quilted Twins fabric is Marshall Dry Goods. Very good quality fabrics. Since Marshalls doesn't have the option of buying 1/4 - 1/2 yards of colour families I think I've found my second best fabric store. And the $5.00 flat shipping is great. Thanks, BattleAxe for recommending them. I've experienced spotty fabrics from Quilted Twins. Some is good, some, not so much. I will only buy from them if it has a name brand. That's been my experience, for what it's worth.